Christmas Enthusiasts are just like everyone else when it comes to shopping: we're all looking for the best bargains available. And that certainly applies to shopping for Christmas lights. Most Christmas Enthusiasts are willing to spend big bucks on their Christmas decorations. But like everyone else, they want the best value possible from each dollar spent. That's one of the reasons that our retrofit bulbs are so popular. Retrofits offer lots of advantages over stringer sets. In general, retrofit bulbs are more durable and longer lasting, and offer greater reliability. And retrofits will save you money in the long run, because when a bulb or two goes out you won't have to trash the entire light line; you'll just pop in a replacement retrofit bulb. 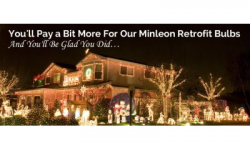 But to get the very best bargain in Christmas lights, you'll want to buy retrofit bulbs manufactured by Minleon. You should know that Minleons are more expensive than many of the LED bulbs on the market. But in spite of that extra up-front cost, they're easily the best value on the market. 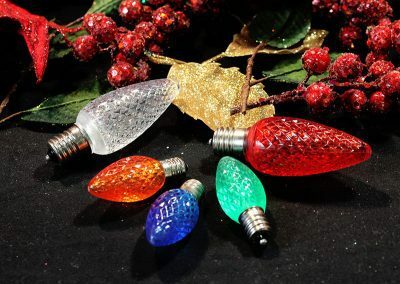 That's because Minleons offer several unique features and advantages that no other brand of Christmas bulbs can match. The Illusion of Value: The low-quality manufacturers want to sell their products for as cheaply as possible. They know that by offering low-priced products, they can give the illusion of offering great value to consumers - an illusion that many consumers fall for. Maximum Profits: By using the cheapest components possible in their products, these low-cost manufacturers can also maximize profits for themselves. But Minleon operates on a completely different philosophy. Instead of trying to make their bulbs as cheaply as possible, they focus their efforts on making the very best bulbs possible. It's a radically different mindset from the cheap-is-everything philosophy that most manufacturers follow these days. And that focus on quality results in some very real differences between Minleon bulbs and their competitors. More Diodes: As you probably know, the light that an LED bulb emits is produced by diodes inside the bulb. And most C7 and C9 bulbs are manufactured with three diodes. But each Minleon bulb is made with five diodes instead of three.That's why Minleons produce a dramatically brighter, sharper glow than other brands of bulbs. And it's also part of the reason that Minleons last longer than other bulbs. If, over time, a diode fails within a bulb, a Minleon will still outshine its competitors. Truer, More Consistent Colors: Color variation in LED bulbs is a common problem among other manufacturers - a problem that many consumers are unaware of. Lets say, for example, that you buy a line of red lights this year. And in a year or two, you need to replace a couple of bulbs in that line. Even though you buy the replacement bulbs from the same manufacturer, it's likely that the colors won't quite match. That's because the cheap manufacturers are just sourcing the cheapest components year after year, and that typically results in some variations in color. But that's not a problem with Minleons, because they make certain that the colors of their bulbs remain constant in tone and hue year after year. Quality Manufacturing Techniques. Unlike other manufacturers, Minleon doesn't take any money-saving shortcuts in the process of manufacturing its bulbs. One great example is the method used to attach the lens cap to the base of the bulb. The lens cap keeps dirt and water from damaging the internal workings of the bulb. With cheaper bulbs, the junction where the lens cap is pressed into the base of the bulb is a common point of failure. But with Minleons, the lens cap is threaded, and screws securely into the base of the bulb. This makes Minleons far less vulnerable to loosening the seal between the cap and the base of the bulb. At Christmas Designers, we've tested thousands and thousands of bulbs from many different manufacturers. In fact, we're constantly testing bulbs to assure that we're always offering you only the very best products. And we've found that the out-of-box failure rate of Minleons is just 1 out of 500 - an astoundingly low failure rate that blows away all the competition. In fact, Minleon's quality control includes testing every single, individual bulb before it leaves the factory. No other manufacturers can make that same claim. 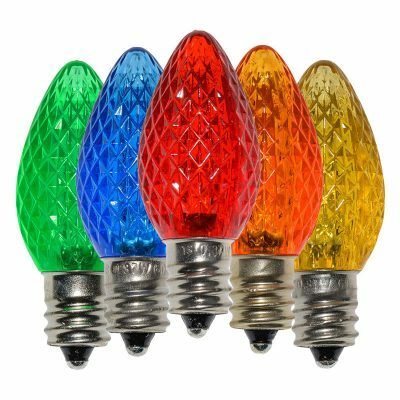 Minleon's focus on quality has paid off for them, because they've grown into the largest supplier of LED Christmas bulbs in America. In fact, pro Christmas installers worldwide use Minleons almost exclusively in the thousands of Christmas displays they create every year. So it's a virtual certainty that every big, breathtaking commercial Christmas display you see this year will be built with Minleon bulbs. At Christmas Designers, we share Minleon's philosophy of providing top quality products to our customers. We know that paying a bit more upfront can save you money in the long run, and provide you with lights that are sharper, brighter, and purer in color. That's why all of the retrofit bulbs we sell are manufactured by Minleon. And that's why you'll be glad you paid a bit more upfront to buy Minleons.